On Monday July 30, 2018, for the first time Liberia joined other countries to observe World Day Against Trafficking in Persons. Tracking simply means the buying and selling of people. 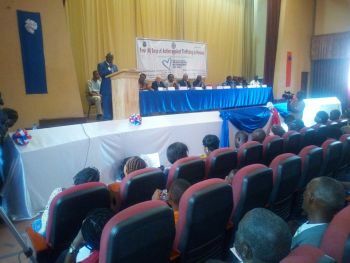 Speaking at the occasion which was held at the Monrovia City Hall, Internal Affairs Minister Honorable Varney Sirleaf​ urged Liberians especially young people to thoroughly investigate offers for jobs and scholarships by individuals or groups in other countries. According to Honorable Sirleaf, research shows that many criminal minded people are using job and scholarships offers to exploit young people. The Internal Affairs Minister also warned parents against people who visit the interior of the country, bring their children in the name of sending them to school, but purposely for different reasons, most times for child labor which is a form of trafficking. Minister Sirleaf promised to work with his county leaderships in combating trafficking in persons. Speaking earlier, President Protempore of the Liberian Senate Honorable Albert T. Chie renewed Government' commitment towards the fight against trafficking in Liberia. He said though efforts have been ongoing in the fight against trafficking, he will ensure the necessary budgetary allocations within the National Budget.